Things to do in Asheville during holidays. Biltmore horse drawn carriage rides. The spirit of Christmas is all around us. Homes are decked with cheerful lights, our mountains are capped with snow, winter wreaths and red bows are adorned all over downtown keeping the magic alive. Although, if you haven’t found that Christmas spirit yet, I have the ticket for you! The romantic and memorable Holiday Carriage Rides at the Biltmore Estate is the perfect way to enjoy the essence of Christmas. 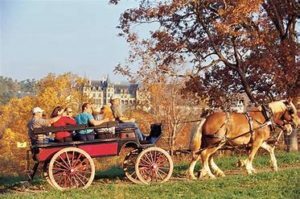 It is a holiday experience you won’t soon forget about while appreciating the grandeur of the Biltmore Estate and the coziness and simplicity of a Belgian Draft horse drawn carriage ride. et the needs of most schedules. Please remember to dress warm for reservations made later in the day! We don’t want any frost bitten noses now do we? 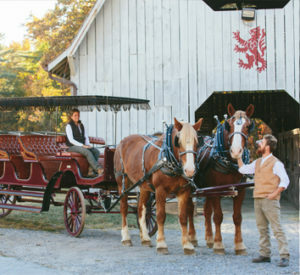 Check out these 3 options for your magical carriage ride. All great choices! You can’t go wrong! This is an 8 passenger surrey carriage ride lasting 30 minutes long. The carriage rides are offered Monday-Thursday at 3:00 p.m., 3:30 p.m., 4:30 p.m., and 5:00 p.m. and Friday-Sunday at 11:30 a.m., 12:00 p.m., 1:30 p.m., 2:00 p.m., 3:00 p.m., 3:30 p.m., 4:30 p.m., and 5:00 p.m. Please remember to call to reserve. The cost is $30 per person and children under 5 are free per each paying adult. This is the 6-passenger vis-á-vis limo carriage for a more leisurely trip around the estate. With it you get stunning views of the mountains and a rarely-seen view of Biltmore House’s west façade. Time slots offered for this deal are Saturday and Sunday at 11:00 a.m., 12:30 p.m., 2:30 p.m., and 4:00 p.m. Cost: $65 per person. One child 5 years and younger free per paying adult. This private 90-minute ride in an elegant vis-á-vis carriage allows you to tour George Vanderbilt’s magnificent estate just as his guests did more than a century ago. Offered daily. Three- to four-day advance reservations are required. Cost: Starting at $350 for up to four guests. This entry was posted in Biltmore, Christmas, Holiday and tagged Asheville, Christmas, Holidays, horse drawn carriage, mountain views, Outdoors, Things to Do, wildberry lodge recommendation by admin. Bookmark the permalink.